Plugging away at a Beethoven sonatina, after months of on-again off-again indecision about whether it was worth my time. The other two pieces I’ve learned, a simplified transcription of the Haendel aria “Ombra mai fu” from his opera Serse and Chopin’s posthumous Waltz in A Minor, never lost their initial seductiveness. It was never a question of just putting my mind to the job until I could play them whatever thrill or lack thereof I got after hearing them twenty or two hundred times. They still move me no matter how often I play them, though now I’m more intent on discovering their inner secrets than from recapturing that first, breathtaking rush. The Sonatina in G Major has been another matter entirely. Like many, many pieces I’ve taken up, then lost enthusiasm for, like a fickle musical Don Juan, the sonatina moved me for a time, then seemed to elude my efforts to get a handle on it–much more so than did the Chopin, though the piece seemed to require less fancy finger work than did the Chopin. I finally gave up on it the way I did so many of those other pieces that tickled my fancy for a time and then lost the sense of urgency I felt first toward them. I felt guilty about not sticking with it, but I told myself, this wasn’t a homework assignment or a paid job. I was playing purely for my own gratification. But something, maybe that same frustration that caused me to set it aside after so much effort expended on it, drew me back. I might, I thought, at least learn to play it passably well so the time already devoted to it wouldn’t have gone for nought. But this time I discovered something that made the piece catch fire for me emotionally. Part of my problem with it was its composer. I have always found Beethoven to be remote–exhalting at times, certainly larger than life, but less relevant to me personally than other composers. Stravinsky is Olympian in the same way. His Sacre has moved me to terror, reaching into deep recesses of my mind I had never experienced before. But I don’t listen to Stravinsky, or much Beethoven. I gravitate toward so-called lesser composers–the Elgars, the Rachmaninoffs. I also made the mistake of listening to how others played it, on YouTube. And that was a mistake not just because it can be discouraging to see how other proficient other amateurs are but because even they play everything fast, if just to show that they can. Besides, I knew there was great sweetness in the piece (it’s even marked “dolce” in some places–Beethoven? dolce?). And that was the cue I needed to rethink it. Maybe it shouldn’t be played “like Beethoven,” at least not by me. All those YouTube performances had thundered away like the composer himself, making spaghetti of the strings on his piano till it was unplayable. Who says genius is its own best interpreter? The truth was, I hadn’t been playing the sonatina any less authentically that those show-offs in the online videos. Played more slowly and with simple (ha!) attention to detail–the strict value of the notes and the scant dynamic markings–the piece became not less easy to play but infinitely more subtle and thus more interesting. And, once it began to reveal its possibilities, it has become moving again in a way it hadn’t since I first hesitantly sounded its notes. I don’t think I’ll abandon the sonatina again, no matter how long it takes me to play it to my satisfaction. 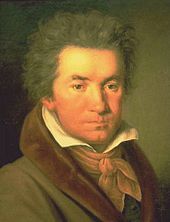 What’s more, it’s opened up an interest for me in learning other Beethoven. Just as his fifth symphony only truly lived for me once in that performance by a chamber-size Little Orchestra Society I mentioned in my previous blog entry, the “real” Beethoven, or at least “my” Beethoven has been revealed to me in this simple piece, rather like that moment we have when someone we thought we knew well reveals something to us about themselves that makes us see them as if they were a different person.